The Amamoor State Forest is located in the Sunshine Coast Hinterland and is home to the Bunya Pine, the Red Cedar, Hoop Pine and White Cedar. It has one of the largest swimming holes in Queensland and is home to various species of endangered frogs and platypus. Amama Walk: 1.5km (return), a challenging 40-minute walk through the lush rainforest. Rainforest Walk: 1km (return), a 30-minute treck with some challenging terrain that will take you through a tropical rainforest and to a large swimming hole. Cedar Grove Hiking Trail: 4.6km (return), a half day challenging trek which requires at least moderate fitness. The track crosses Amamoor Creek and returns to the camping area. 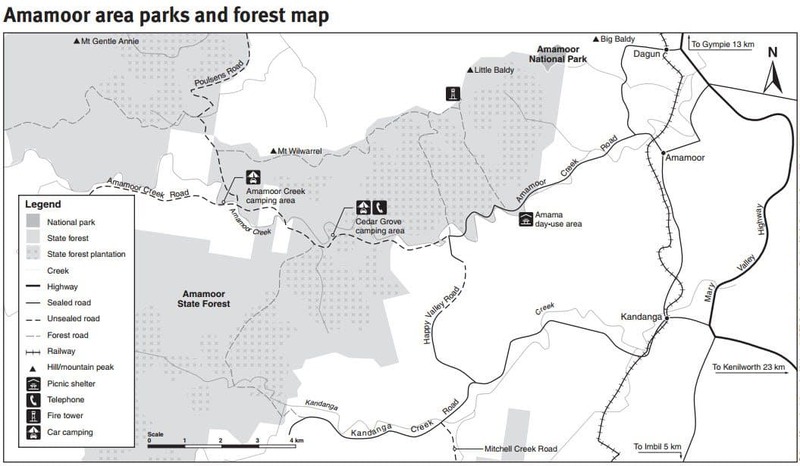 Amamoor Creek Hiking Trail: 2.5km, a 2.5hr long track which takes you through the open eucalypt forest with some challenging sections. Moderate fitness required. If you are looking for accommodation in other areas of the Sunshine Coast, click the link below for the best accommodation deals.